Kojak board game by arrow games ltd – This has to be the worst bored – sorry i mean “board” game ever. the game play was minimal. In fact as with most board games that are churned out a factory with a popular TV show attached to it, it is no more than the same game repackaged and popularised for the fleeting moment. Who loves you baby? You may ask! The game was for 8 years and up. It was based on the streets of Manhattan, New York. 4 detectives competing to make the most arrests in the Manhattan South precinct as they try to solve 4 crimes. A crude roll & move game has cars moving round the track, collecting Contact Cards, Trap Cards, Warrant Cards by making exact rolls onto certain squares. 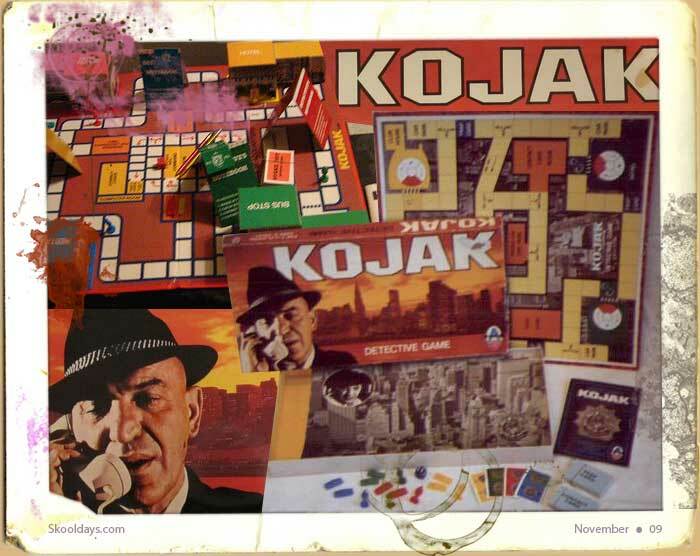 Kojak board game by arrow games ltd was no more than a case of getting your assignment with a Contact Card, move a car into the right car park for surveillance, move the criminal into the red space using Trap Cards and book ’em Stavros. For 1975 this game was pretty poor. Kojak was a very popular cop detective show in the seventies. Most will remember Telly Savalas who played Kojak due to his incredibly bald head. Any kid at school who stuck a half football on there head was Kojak as was any guy loosing his hair. Kojak also had the problem of smoking in early episodes, which wasn’t great for kids as they also needed something to stick in there mouths. The answer was a lollipop. I think we had one called a traffic light lollipop, as it started off red and then went to amber and finally green. Now our lungs were safe and our teeth could rot! So what else sis the Kojak game have about it. It was so forgettable that if anyone else has any memories, then let us know by posting a comment below. This entry was posted in PrimeTime, Toys and tagged 1970 by Skooldays. Bookmark the permalink.